Job Postings are prominent text ads that appear at the top of our jobs pages. They are available for all areas of South Carolina and all types of employer. Featured Job Postings are ideal for advertising individual positions as well as job fairs, employment training opportunities, and other career resources. Featured Job Postings cost $95 and run for a 30-day period on one page. The advertised position may not be swapped out during this ad term. If you need to advertise another position, you will need to purchase a separate Featured Job Posting. Featured Job Postings appear before any other content on the page. When multiple Featured Job Postings appear on the same page, the order of the postings will rotate each time a new visitor arrives to the page. Please know that your posting will always appear on the page – sometimes it will be first, sometimes it will be last, and sometimes it will be in the middle. This method is used to ensure equality among our advertisers. Just fill out the quick, secure form below. Turnaround time is 2 business days at most. 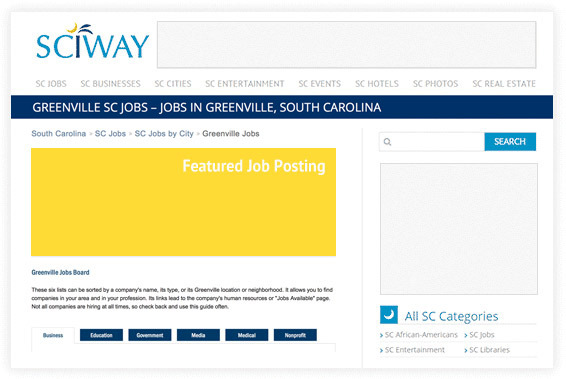 Featured Job Postings are not available on our main SC Jobs index. To advertise on that page, please see Recruitment Banners. Briefly describe the available position (60-word limit). We are happy to link to a page on your website with a complete description. Make sure you include how candidates should apply.